In Iran there is a growing push to eliminate the “Death to America” chant that has long been a staple of Friday Prayers and other public outings. With the exception of the immediate aftermath of 9/11, when the streets of Tehran filled with mourners, Friday Prayers in major cities of Iran have featured a “Death to America” chant since the U.S. and Iran broke off diplomatic relations during the hostage crisis. These chants and Iranian political leaders referring to the U.S. as the “Great Satan” have often been used in the West to argue that the Islamic Republic of Iran is inexorably hostile to the U.S. and the West. Perhaps cognizant of this, some are now pushing for the phrase to be eliminated from Iranian public discourse. Most notably, early last week former President, Akbar Hashemi Rafsanjani posted a note to his website claiming the Grand Ayatollah Ruhollah Khomeini, the founder of the Revolution, had agreed with Rafsanjani that the use of the “Death to” chants, including “Death to America,” should be discontinued. Since Khomeini’s death in 1989, Rafsanjani, who was a close confidante of Khomeini, has often recalled private conversations between the two about controversial topics such as who should succeed Khomeini. Rafsanjani’s website posting was widely covered in the Iranian press last week. 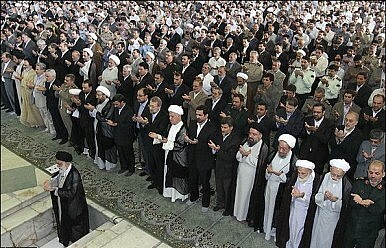 Many outlets noted that no one besides Rafsanjani had heard Khomeini denounce the death to chants. However, not long before Rafsanjani’s posting, an undated quote from Mohammad Taghi Rahbar, Esfahan's Friday Prayer leader and a former parliamentarian, surfaced in which Rahbar reportedly suggested that the use of the “Death of America” chant shouldn’t have to continue forever. Last Friday it initially appeared that hardliners in the regime intended to push back against the calls for the cessation of “Death to America” chants. Interestingly, Harandi quickly denounced these initial media reports, claiming that they had reported the facts incorrectly. According to Harandi’s account, after the spontaneous chants of “Death to America” began, “I said I call on you to stop chanting,” but noted that the reason people were chanting this was because they are angry at America’s actions today. More importantly, the fact that Harandi felt compelled to quickly denounce the reports suggest that the powers that be in Iran may be contemplating an end to the “Death to America” chant.